Fly Fishing the Middle Fork Willamette River: This is a nearby option for local Eugene fly anglers to encounter a hatch and good wading conditions. Located within the Willamette National Forest, this river has great walk in access and fishes well year round. Spring Summer angling offers excellent nymph fishing as well as numerous traditional western hatches. Green Mckenzie Caddis come off in May/June fishing can be excellent. When summer heat sets in evenings are best. Click on the link above for the latest report. McKenzie River Fishing Reports: One of the wests true gems, the Mckenzie River offers 60+ miles of fishable water during spring and summer. The Upper McKenzie River (above Blue River) is more difficult to boat and wade, but offers an excellent wild trout fishery with crystal clear water and old growth forests. The Mckenzie river trail offers bank access. The Middle McKenzie River between Blue River and Leaburg Dam endures the most trafic over the spring and summer. A mix of hatchery and native rainbows make this river productive even when hot summer days limit “hatchtivity”. The Lower McKenzie River below Leaburg Dam is very good for steelhead and trout. Summer mornings and evenings often offer the best oppurtunity. Bank access is better than in the middle section. As the water drops wading big bars and islands can be very productive for native rainbow an cutthroat trout. Click on the link above for the latest report. Central Oregon Fly Fishing Reports: Innumerable opportunities include the Cascade Lakes and the Deschutes, big rivers to tiny stream fishing. Spring-Summer conditions start out with the Salmon Fly Hatch on the Deschutes and Chironomids on Craine Praire, and super terrestrial fishing during the late summer on all moving water in central Oregon. 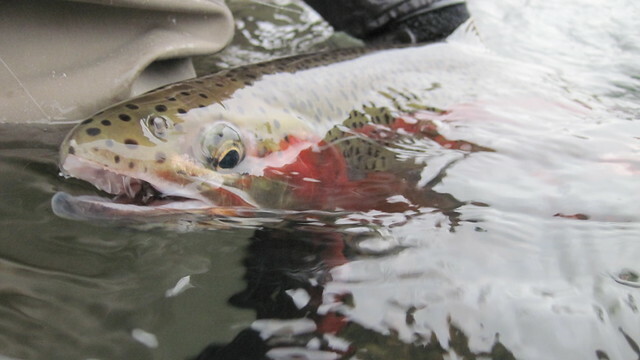 Click on the link above for the latest Central Oregon Fly Fishing report. 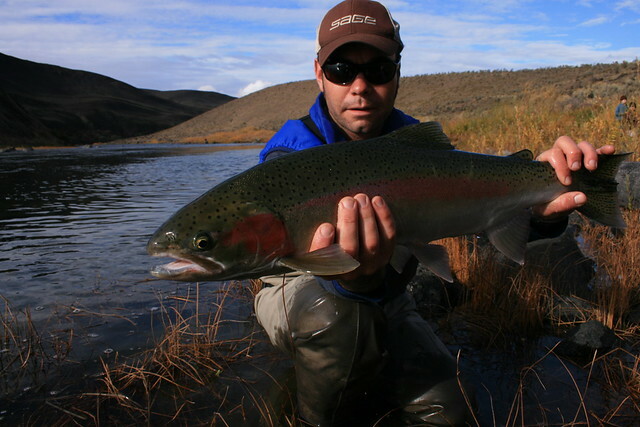 Oregon Summer Steelhead Fly Fishing Report: Oregon boasts world class fly fishing for summer Steelhead. The North Umpqua River’s Summer fish arrive in late June and are available until the river goes out of shape in November. The Umpqua offers anglers a great challenge in terms of fishing and wading, studded boots are a must. July and August can be incredible with chances to “skate up” a huge wild summer fish with a dry fly. The McKenzie and Willamette River town runs also offer summer run hatchery fish. This section will also offer reports on the Siletz River summer run. Click on the link above for the latest Oregon summer steelhead fishing report. anyone out there heard anything on the Moffit fly method ? thinking of giveing it a try my self, it’s easy to look up on the web would appretiate any imput. I hope to try a couple of these rivers this summer. I am vacationing in Oregon and staying in Lakeside, 10 miles north of Coos Bay. Fly slection to use in Loon Lake for trout? Also fly fishing for smallmouth bass on the Umqua river, suggestions on best fly to use? New to Eugene and excited to get fishing. What are the water levels to be looking for on the McKenzie and Willamette for flies, and which meters? Lower McKenzie producing big redsides during late afternoon in faster water on Mega Prince and Golden Stone Fly nymphs. Yesterday, on the 9th me and two trout bum buddies drifted Hayden to Armitage and had several encounters with fish in the 16-20″ range. The water may be cold, but the fish are hot. From our experience yesterday, with the water still quite chilly, the fish are a bit resistant to consistently look up at dries. Yellow sallys came off nicely in the heat of the day, with PMDs coming off later in the day, and Caddis coming off from midday forward. Get out and fish & goodluck!!! Dave, call the Caddis Fly: 541-342-7005! They’ll find you a great guide and get you outfitted. Thats badass guys! Super awesome, I envy those who can outfish me with a fly while I’m spin-casting. I was looking to get some ideas on some fly fishing trips, and was hoping people could share some of their experiences. Me and my buddy our looking to pack up the drift boat and head up to Oregon then to Idaho. Does anyone have a trip they’ve done where they could share the rivers and the routes. Just relocated here from San Diego and am taking the plunge to learn all I can about fly-fishing and it is a rather steep learning curve but I am determined and it is nice to know that the gents at Caddis are so helpful and forgiving of a complete newbie!!! I am hoping to get my first cast out on the water in the next few weeks after my rod and reel arrive.